I stand at the threshold of a new year. May God help me be kind, fair and wise in all my dealings! Allah is enough for you! Have patience! If you’re going through a tough moment, realize the fact that it is just an imtihaan (test), a mere aazmaaish.. ask Him for forgiveness of sins.. any wrong doing.. big or small.. the Almighty, the most merciful will forgive.. continuous dua and astaghfaar would make your mind go light.. and your heart will feel content.. Shaitaan will strike.. he’ll provoke you.. don’t dare go weak.. for he is not stronger than you.. hang in there.. remain within the limits of sanity.. have a grip on your nafs. Allah is with you at all times, He loves you and He is all you need. And beshak, Allah tumhain kaafii hai (Indeed, Allah is enough for you). Just have sabr (patience).. Everything will be okay. May Allah forgive us and give us all hidayat (guidance). May He increase our eemaan (faith). InshaAllah and ameen. I read this on a page on facebook that I follow; thought I’d share it here.. We have been taught “to forgive, but never forget”, right? Most of us lie when we say that we have forgiven the people for their mistakes and wrongdoings but then we continue to remind them of their mistake sometimes. Maybe in anger or maybe just to tease or make them feel hurt. Is this a forgiveness we want for ourselves as well? When we raise our hands in humility towards heavens and we beg for forgiveness, what do we ask for? What kind of forgiveness do we ask for? We want a clean chit from Allah that we have been forgiven COMPLETELY. We want another chance. We want our huge and endless list of crimes to be erased. We want Allah to accept our repentance and allow us to start again. We don’t want to be reminded of it, or have it come back to haunt or to taunt us. We want our sins to be forgiven here and veiled on the day of Judgement!! Subhan’Allah, the mercy of our Lord, the Most Merciful is so much unique that Allah Subhanahu Wa Taa’la after forgiving a repenting believer never reminds him of his wrong deeds, neither in this world nor in the hereafter! Hence, If we want to be forgiven completely, we must learn to forgive others completely. May Allah help us not to bear any grudges towards anyone, to treat one another properly and to forgive another completely. Each one of us has the right to make a choice.. Although at times one is required to make compromises, for that special someone, for family, a child, for friends, and just some random people you come across in life out of the goodness of the heart.. and at times, these very people, although I’m sure they don’t intend to, begin taking things for granted.. anyway. Coming back to choices.. I’ve always believed that it’s all.. and everything that happens to us is somehow linked with the choices we make in life. Often, when choosing a path that may have extreme obstacles, we do so with the thought that our choice will lead to a decision that would not harm us much and at the same time its impact would gain another person more benefit. That’s that angel in us just being selfless :p , knowingly exposing a vulnerable part of ourselves in front of others to simply have fun with.. exploit it at a certain level..
What actually leaves me bamboozled with a deeper intensity is when at times we make a decision that is wholly and solely for our own good, need or simply fulfills our desire, people, some of them who are in fact our very own and close to heart will not take a second to think or hesitate before labeling us.. as a self obsessed brat, slash, the most typically selfish being alive on the planet! is all I’d like to let em know..
Well, no offense intended to my dear(ies)! I love you! This isn’t to hurt u or make you feel bad if by any chance you read this. Just that today, I choose to be free of worries for no1 else but myself. Today, I choose to be happy for no1 else but myself. Only when you stop *needing* those things that desperately chase (love, status, money, career, people, etc) will you get them. Allah is raising you and teaching you to only depend on Him. At times, this is done by withholding. Just like if someone is dependent on a drug, the only way to break the dependency is to withhold the drug. After the dependency is cured, then you will have it or be sufficed in another way, insha Allah. The lesson is to learn to seek everything only through the Source. This time, we have been divided into groups. And each group has been assigned a Mentor. So we, that’d be Khateeb Ibrahim, Atif Shahzad, Khizar Anjum and myself have Farhan Hussaini assigned as our mentor. Apart from the professional associations that each of us might have had with Farhan over the course of several different projects, we know one thing about Farhan on a one-to-one basis. He is an extremely down to earth individual and believes in being a team player, so that no one’s ever left behind. I recently found out that he’s also a pro at Table Tennis, having earned the Table Tennis Championship. It was Farhan who provided us with the food for thought.. regarding Ego during our first session of the mentorship program. Farhan shared his thoughts upon how ego is developed within one; when we acquire information, expertise, knowledge, we sense a feeling of empowerment within. And that’s when ego is born. We tend to unconsciously compare our recently attained skills with those who do not have it. EGO; the word itself emits an aura that seems to look DOWN upon things and people in comparison to itself. This attribute in one tends to make one selfish, commanding, expectant beyond reasonable expectations, in fact, if you take a shot at being blunt and call such creatures egoistic, they’d be down right offended and look down even deeper at you! lol! Kill that Ego! When Farhan pointed out first that each one of us have some bit of ego within us, I know we were all smiling. Nobody objected as such. And we did all nod when next he said that it was essential that we Kill that EGO! The least that action would do is make you humble and empathetic 🙂 and without an Ego, it would be easier for you to deal with any kinda person in your life in a humane manner, be it a personal or professional situation. 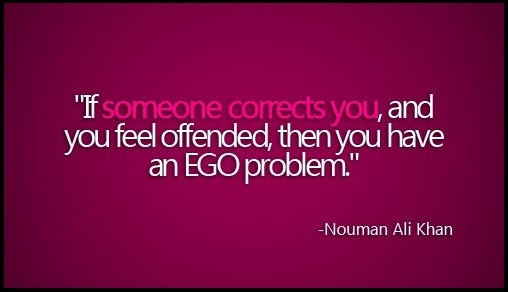 Originally posted on sara@sakonent; Kill the EGO. Ya Allah, Ya Rabbe Kareem, ya Allah we have wronged ourselves, Ya Allah You showered the most incredible blessing upon us, You made us amongst the Ummat-e- Mustafa sallal Laaho aleihi wa aliehi wasallam, Ya ALlah You granted us this incredible honor to be a follower of the Last and greatest Messenger, the greatest of all of Your creation, Ya Allah Ya Rabbe Kareem, Ya Allah we have wronged ourselves, We have allowed ourselves to become distant from his Sunnah, Ya Allah we have allowed ourselves to be distant from his seerah, Ya Allah we have allowed ourselves to be distant from his sifaat-e- Mouminana, Ya Allah Ya Rabbe Kareem, Ya Allah we ask You to restore to us his naboo’at, and to restore us to our ummati-ness, Ya Allah we ask You to make us amongst his Kaamil followers, amongst his Kaamil inheritors, Ya Allah Ya Rabbe kareem we want to meet the Prophet sallalaaho aleihi wa alihi wasallam in such a state on the day of judgement that we are able to recognize him, and that he is able to recognize us, that we are able to lay claim to him, and Ya Allah that he himself lays claims to us as his ummati, Ya Allah we ask You to grace us by having the shifa of Rasool Allah sallalaaho aleihi wa aalihi wasallam, let him intercede for us on that day, let us get a place on his ranks and his sahfoof in his rows on the day of judgement, Ya Allah ya Rabbe Kareem, let us get a place in his shade on the day of judgement, and let us get a place in his shade in Jannah for all of the Aakhira for the ever lasting after life, Ya Allah Ya Rabbe Kareem, we ask You to Guide us to the path of the Sunnah, the way of the Sunnah, the teachings of the Sunnah, the lifetime of the Sunnah, the emotions of the Sunnah, and the mentality of the Sunnah, Ya Rabbe Kareem we ask you to restore to us this identity of being his follower, Ya Allah we ask you to increase our love for the Prophet Muhammad sallal laaho aleihi waalihi wasallam, our love as the love as his Sahaaba-e- karaam raziAllahtaAlah anhu, our love for all of those who love him, our love for all of those who were beloved to him, our love for each and everyone of his actions, anyone and each one of his statements, each and everyone of his feelings, Ya Allah Ya Rabbe Kareem, we ask You to accept our Dua, we ask You to drown us into the Sunnah, from the tips of our hair, to the soles of our feet, from the outermost part of our skin, to the depth and inner most core of our being, Ya Allah we ask You to drown us into the Sunnah life, in the Sunnah way. May Allah increase our iimaan. inshAllah and ameen. Sometimes we lose hope in turning to God and asking for His help because we feel like we have done too much wrong. And yet think of a child who has just angered his mother and immediately after trips and falls on the stairs. Even if that child had just angered his mother to tears, the moment he falls and cries for help, she runs to him. This is human mercy. And God is infinitely more merciful than a mother is to her child. So, do you think–no matter what you’ve done–when you’re falling and cry out to the *most* merciful…He wouldn’t come save you?